We have clients who come to Craftbuilt for their kitchen planning and renovations needs. And there are times that they decide to have their bathroom installation, spearheaded by us, too. 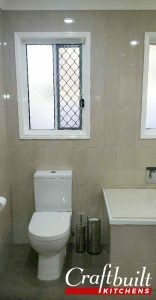 This one particular Gold Coast bathroom was uninspiring and badly designed so Craftbuilt thought outside of the usual ideas. 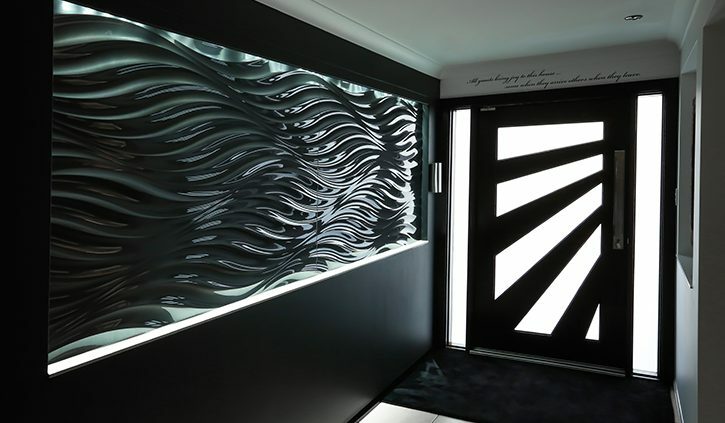 After a thorough inspection, planning and installation process, the results are stunning. 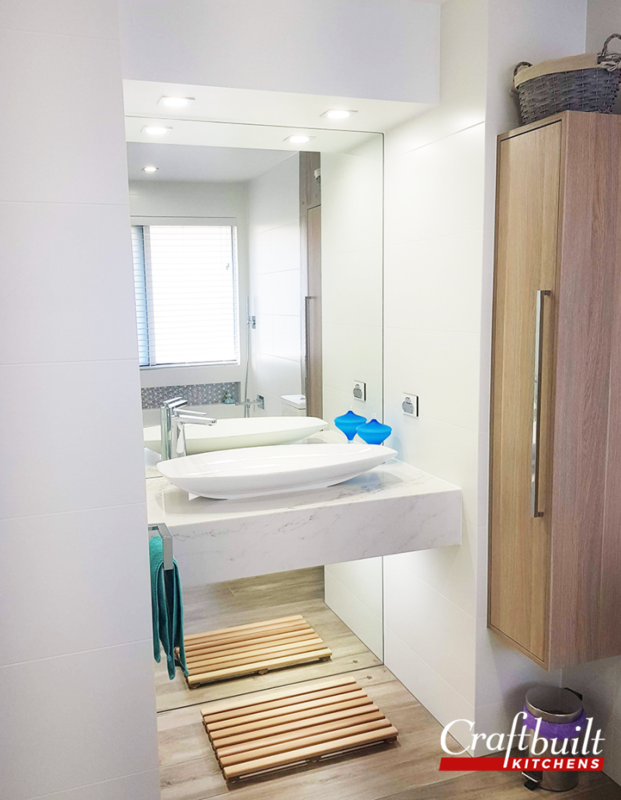 The usual standard vanity cabinet was not installed, instead a Caesarstone Imperial Grande floating vanity was positioned between two walls with the plumbing hidden inside and a separate custom-built wall hung cabinet finished in Polytec Ravine Maison Oak. What was a tiny room now appears very much bigger due to the clever use of mirrors and lighting. 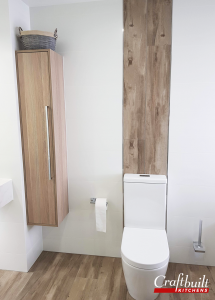 The dark wood effect tiled floor gives warmth which counteracts with the plain matt wall tiles. It also breaks up a big expanse of white on the wall, a strip of floor tile was laid up behind the water closet. Glittering feature tiles were used in the niches in the shower and above the bath to add a little ‘sparkle’. 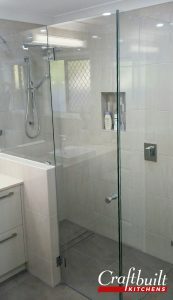 Frameless shower screens and a back to wall bath add to the modern, clean lines accented with Italian designed tapware. The final luxurious touch was a heated towel ladder to warm the towels on a cold winter morning. 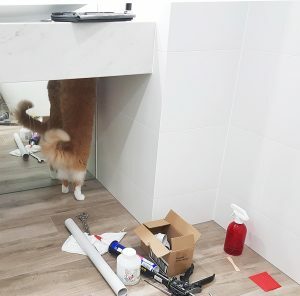 You can see Gordon, the adorable but stern, site foreman inspecting everything, from beginning to end, to ensure the workmanship was to Craftbuilt high standards. We were relieved to find out that Craftbuilt lived up to his expectations – and the client’s too! Another Craftbuilt Dream Bathroom achieved! If you’re looking to accomplish your own dream bathroom or kitchen project, our designers at 76 Old Cleveland Road, Stones Corner are happy to help you. You can also call us at (07) 3341 9172 to set an appointment. What Are Interest Free Kitchens And How Can I Get One? Did your dishwasher stop functioning? Are the doors all chipped? Are your kitchen shelves falling apart? It may be high time to renovate your kitchen. At what cost, though? You may be thinking you can’t afford it right now. The truth is your dream kitchen can become a reality even though the pocket disagrees. Clients can still have their dream kitchen renovation using interest free finance. What are interest free kitchens? Simply put, it means that Once finance pay for up to 60% of your kitchen for an agreed period interest free. You can then pay off the amount entirely within the interest free period with no penalty. 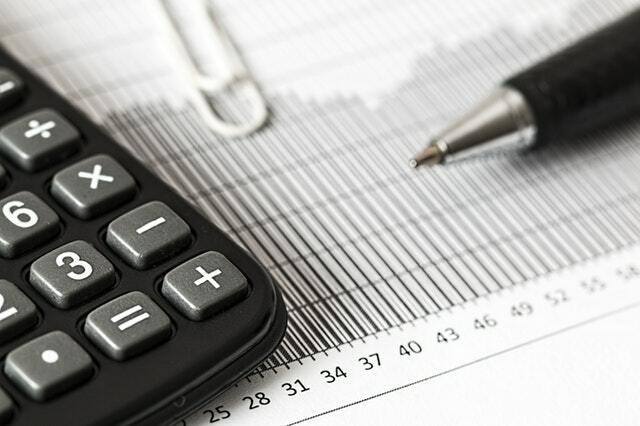 When the interest free period has finished (usually 12-18 months), you will then be charged interest on the remaining balance until it is paid in full. What are the advantages when I opt for an interest free kitchen? You will have the freedom to start planning to install your dream kitchen straight away knowing that you have the full interest free period to complete the repayments. You can truly have the kitchen of your dreams with all the bells and whistles due to payments being more manageable as they are spread over the entire interest free period. The additional cost to have exactly what you need may be negligible when spread over time. How do I apply for my own interest free kitchen? If you are currently not a Once Credit customer, applications for pre-approvals can be done online. It’s simple, and there is no commitment to purchase. See our website to find the link for the online application. If you are already a Once Credit customer then all you need to check is your credit limit. Does it take a long time to get approved to get my interest-free kitchen? Approval notification is within seconds via e-mail once you have completed the online application form. If you are not already a Once Credit customer, simply visit our Craftbuilt website to find the link for the on-line application form. All you need to do is complete the application form and you will receive the decision via email within seconds. When can we start building my interest free kitchen? Once approval has been granted by Once Credit, it is all systems go! Craftbuilt will be notified by Once of your approval. From there you can make an appointment with our friendly design staff to visit you in your home to discuss ideas to replace, improve and modernise your kitchen. You are then ready to select colours and finishes together with your designer who will then walk you through the final paperwork. From there we will arrange a check measure appointment and your kitchen will then be in the production process at the factory and only a matter of weeks away before being installed into your own home ready for you to use. With Craftbuilt Kitchens, the whole process is easy. Craftbuilt offers you interest free finance allowing you to buy your new kitchen today while paying for it over time – interest free. When you’re ready, you can apply for interest-free finance and start planning for your dream kitchen! https://www.craftbuilt.com.au/wp-content/uploads/2018/03/pexels-photo-209224.jpeg 426 640 osweb https://www.craftbuilt.com.au/wp-content/uploads/2017/04/craftbuilt-logo-2.png osweb2018-03-26 00:42:342018-11-07 12:23:25What Are Interest Free Kitchens And How Can I Get One? Once in a while, we would have clients approaching us if we could also help redo their bathroom. 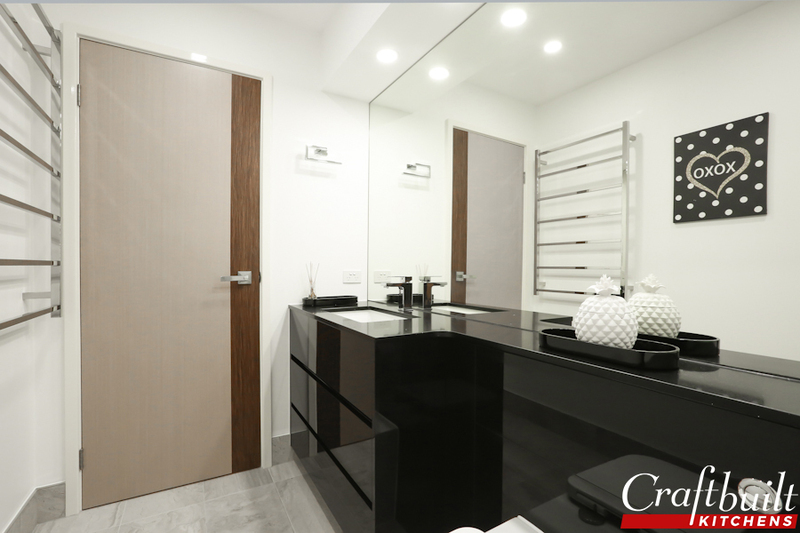 Craftbuilt Kitchens are happy to accommodate complete bathroom renovations. We already have our highly reliable trades team for our kitchen projects which enables us to streamline bathrooms projects, too. After our clients from Parkinson asked us to renovate their kitchen and was so happy with the results, they asked us to renovate the Family Bathroom. Our experts went to work right away. 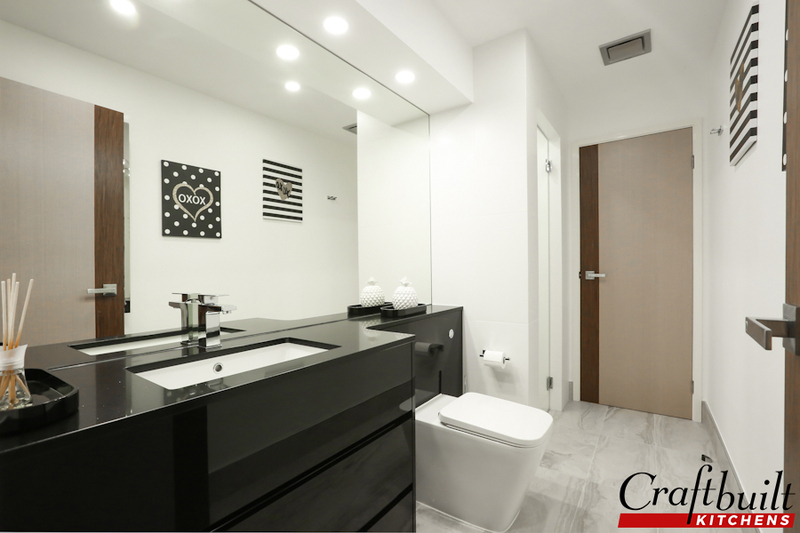 Craftbuilt Kitchens turned a dark dated bathroom and separate water closet into a modern, bright, light and welcoming new space. 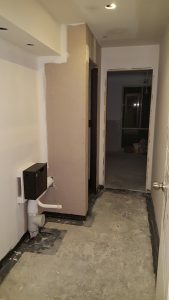 During the process, we removed the wall between the water closet and bathroom. We completely stripped the bathroom so we could check for any water damaged timbers and to make any repairs so the bathroom would have longevity, look good and function for many years to come. And when it came to the flooring, the room was completely tiled, re-painted and the half-height nib wall was re-built. Our tiler mitred and resin filled the external edges to do away with the need for chrome edging strip which gives a stream-lined continuous look and no nasty dirt-harbouring gaps! For the lighting, the clients’ wall lights were installed along with a large amount of ‘Daylight’ ceiling downlights – all on separate switches to give a different ambience as the mood takes you! The theme and feel of the whole bathroom design used warm tones (which were also used in the kitchen which are so loved by the lady of the house). 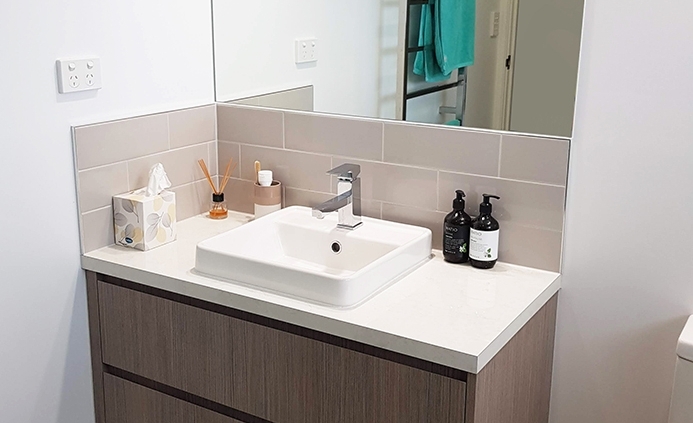 We added modern twists such as the ceiling to benchtop customized mirror and Methven Rere tapware with Azzura & Arto fittings which have a square shape. Adding the vanity touches – we custom built the vanity to fit around the new Decina bath and to utilise the space behind the head of the bath and as the client rarely uses the bath we made and installed a 2 pack shelf with a finger pull to sit snugly on top – a great area to place clothes! And we didn’t forget about the storage. The 2 pack cabinetry incorporates soft-close drawers and Ceasarstone Creme Brulee benchtop with a Caroma Liano Lexus basin. The custom built frameless shower was extended to give a feeling of space and light in the bathroom, the rainfall shower head and separate riser rail offers different showering experiences. Of course, a heated towel ladder is a must during the winter months – nothing more luxurious than wrapping up in a warm towel after showering. 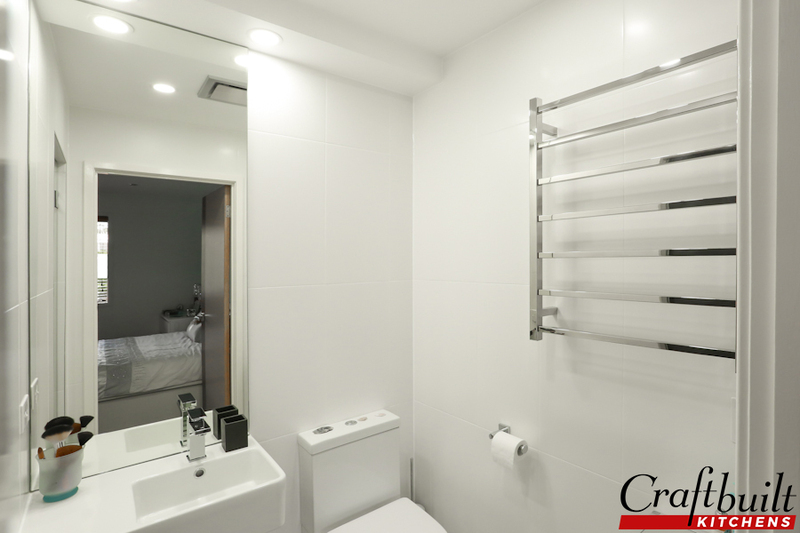 ​A warm and welcoming bathroom was the ultimate result!​ A dream bathroom built by Craftbuilt. Our tradesmen have been with us for so many years and have always prioritized our jobs. Coupled with our systemised scheduling, bathroom renovations run smoothly and efficiently. That is exactly the reason why our clients at Parkinson trusted us with their bathroom needs. 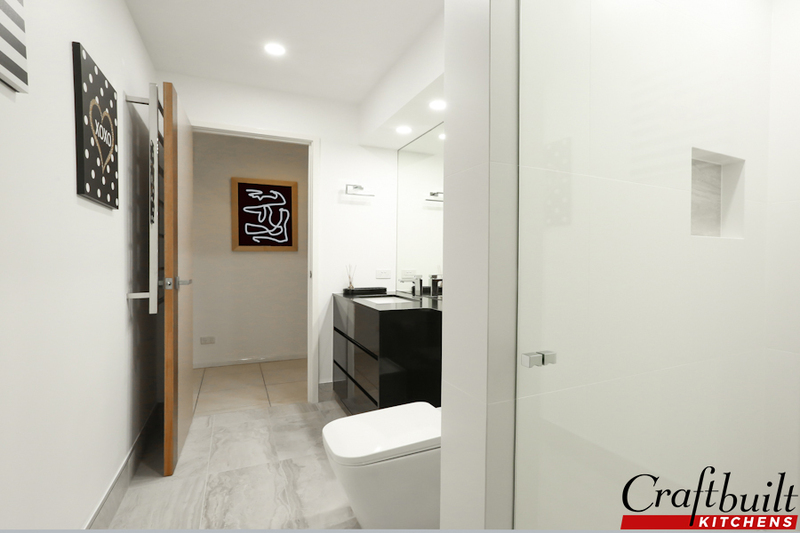 If you’re planning a bathroom renovation any time soon, give Craftbuilt Kitchens a call at (07) 3341 9166 or visit our showroom in Underwood and meet our lovely designers! 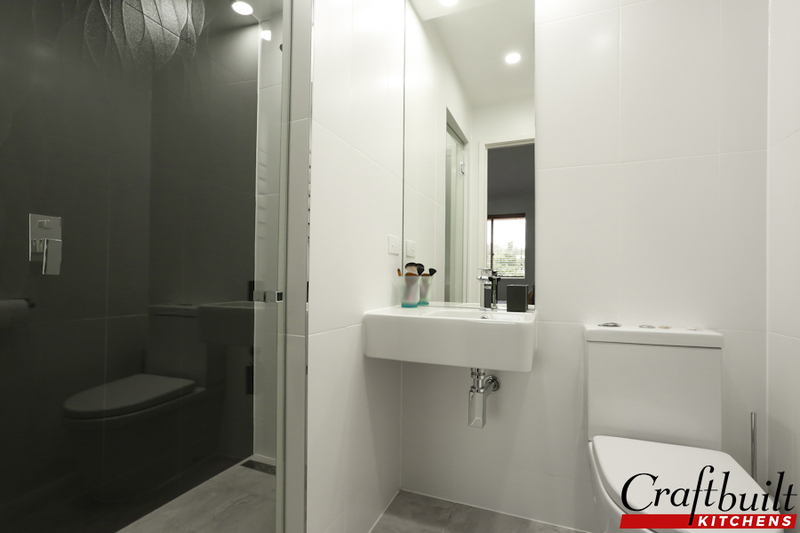 Previously, we showed a snippet of what Craftbuilt Kitchens had to fix up in this Coomera Bathroom Renovation. 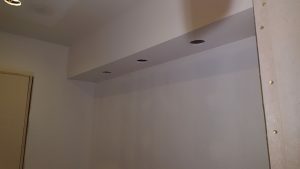 As the construction continues, a bulkhead was built above the vanity with downlights fitted underneath and a custom built mirror was placed on the whole wall to give depth to the room. 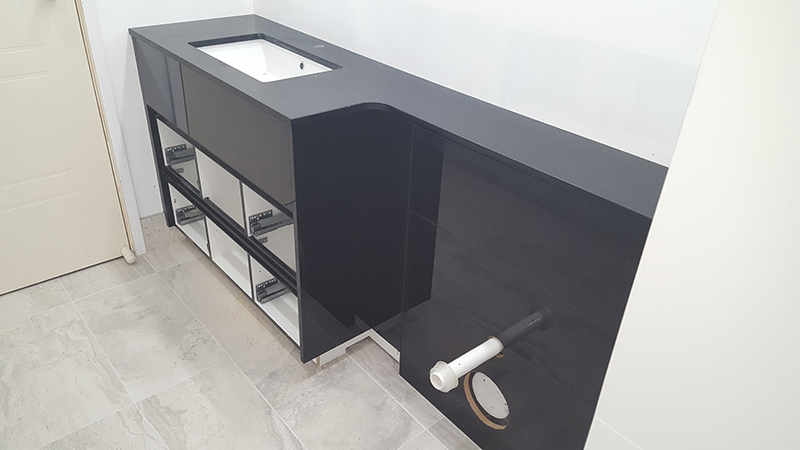 Handless cabinetry finished, in a high gloss black with Smartstone Astral Black engineered stone benchtop and an undermount basin, gave a seamless feel to the vanity whilst utilising storage space. 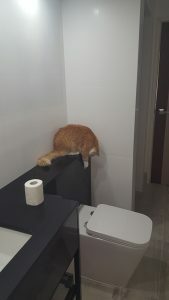 Everything fitted so well and built perfectly to its function that even the cat wanted to test out the flushing! 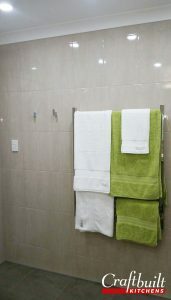 Plain matt wall tiles only in and around the shower blended in with the white walls for a fresh contemporary feel. When it comes to bathroom renovations, space matters. 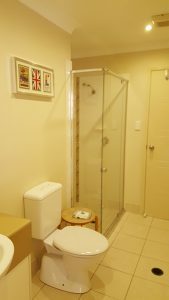 The shower was made larger and a bulkhead above the custom made frameless shower door gives a luxurious showering experience extenuated by a rainwater shower head – the pleasure of rainfall without the disadvantages. It gives a sense of tranquility & relaxation. Accessorised with square fittings and a towel ladder completed the modern but timeless luxurious bathroom. A black and white bathroom never goes out of style. Here is the complete look of the whole bathroom space. The clients, and even the cat, adores the new bathroom. They agree that the difference from the old bathroom to the newly renovated one is amazing, and have already received tons of compliments. 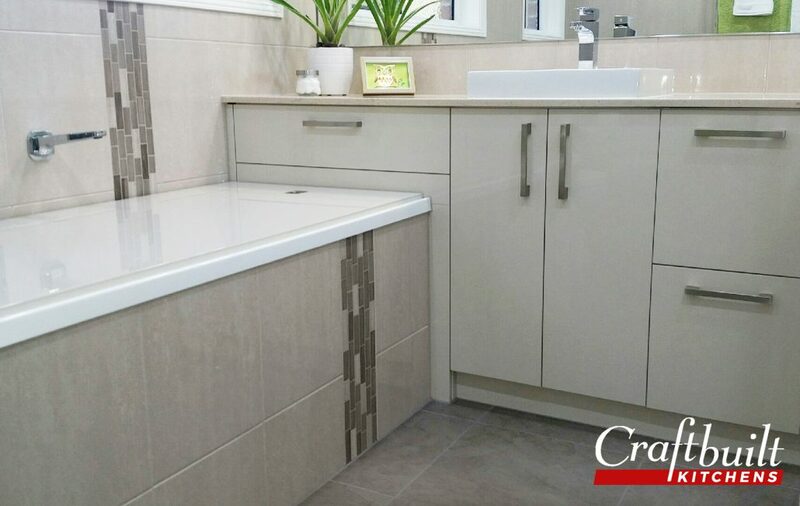 In the client’s own testimonial, Craftbuilt Kitchens fulfilled her dream bathroom. She has the bathroom she wanted and she is ecstatic, receiving a ton of compliments from friends and family. 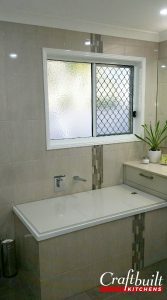 Are you thinking of rebuilding or renovating your own bathroom? Contact Craftbuilt Kitchens today at (07) 3341 9166 or visit our showroom at 2958 Logan Road, Underwood QLD 4119. We design with you, just for you! Craftbuilt Kitchens are happy to accommodate complete bathroom renovations. 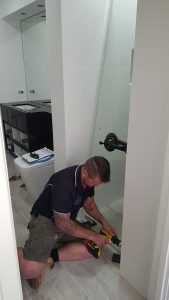 We already have our highly reliable trades team for our kitchen projects which enables us to streamline bathroom projects, too. Our tradesmen have been with us for many years and due to our fantastic relationships, they have always prioritized our jobs. Which is why, when coupled with our systemised scheduling, bathroom renovations run smoothly and efficiently. Recently, we had kitchen clients who wanted to work with us on building their dream bath because of the quality of the workmanship – in their own words! Our tradesmen set to work on a very dated dingy double-entry downstairs bathroom. It was long and narrow with a door at either end and needed a completely new look. There was also the need to hide a soil pipe which came down from a newly-created bathroom upstairs. 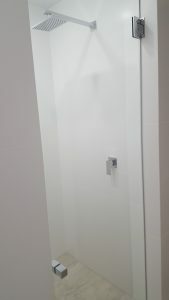 To remedy the soil pipe concern, a new nib wall was built to hide the soil pipe from upstairs and a concealed cistern was fitted into the cabinetry which also hid the upstairs soil pipe as it joined the soil pipe downstairs. A mission the Craftbuilt tradesmen set to work on, right away! Find out how this outdated bathroom turned into a dream bathroom! A sneak peek below. Can’t wait to check out the finished product? View the complete bathroom renovation work here. “Craftbuilt were awesome and nothing was too much trouble, all my questions were answered promptly, communication was great and the quality of the workmanship is second to none. I have the bathroom I wanted and I am over the moon! We Want A New Bathroom For Christmas! Christmas is a wonderful time of the year with so many expectations surrounding such as the traditional celebrations and customs. The giving of gifts is a case in point. People who take the time to do some sneaky sleuthing get this right and delight their loved ones. Gifts are exchanged, unwrapped, exclaimed over, played with and generally enjoyed until something else takes their place. In the cold, harsh dawn of the New Year, reality sets in and thoughts turn to how the money spent on gifts could have been better allocated. There is no suggestion that gifts should be abandoned altogether, but smaller, less expensive ones could leave the way open for one single gift that would benefit everyone in the household. This is where brave people put up their hands and offer a better suggestion. Would a large gift that brings permanent pleasure and comfort to the whole family be a better option? Could that gift be something that everyone wants and the household needs but nobody has taken the initiative to propose? How about spending some of that Christmas cash on a brand new, clean, gleaming, ultra-modern and stylish bathroom? If you could see this scenario being accepted at your house, now is the time to get things moving. The bathroom is one of the most neglected rooms in most households, serving a very necessary function, but often a poor cousin to the rest of the house. When renovations are planned, too often the budget runs out before the bathroom is touched. A new kitchen, perhaps an outdoor room or entertainment centre, general study area or a complete makeover of soft furnishings and floor coverings are the main areas that get the attention and the budget. The bathroom is still serving its purpose, so it is put on the backburner for the next round of renovations. Before you know it, ten years have passed and it still looks shabby and unloved. Now here’s the plan. 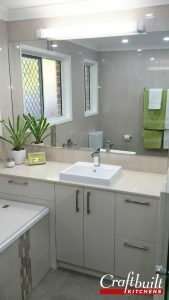 The first port of call is a professional bathroom renovations company that will design a completely new bathroom. 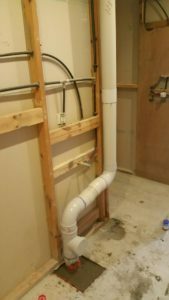 To get the best effect, everything should be up for grabs including the location of the plumbing. Often a bathroom renovation is compromised because the owners don’t want to incur the cost of moving the taps and shower heads around. This is a pity because they miss the opportunity to have a completely different layout that is stylish and contemporary. Once the decision is made to start from scratch, everything is possible. 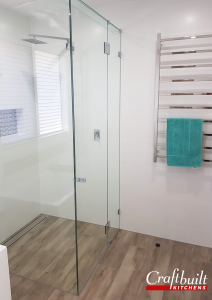 Reinforced plain glass shower screens, twin vanity basins, new fixtures and fittings in the latest materials and colours, exciting tile designs, modern bath and matching shower tray – the choices are mind boggling. Involving the whole family in the planning and choice of colours is the key to maintaining the excitement. It will also help them to stay patient when the actual renovation begins and they need to find an alternative location to shower. If this has rekindled the desire to bring the bathroom up to date to complement the rest of your home, tell the family it’s an early Christmas gift. 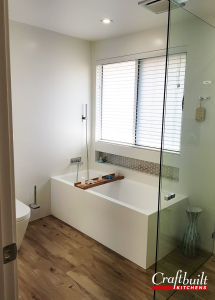 Set a budget, talk to a bathroom renovation specialist who will arrange design drawings and co-ordinate all the trade work, and organise your funds. A new bathroom will add thousands of dollars of value to your home and next Christmas will be totally awesome. Are you ready to plan for your bathroom renovation? 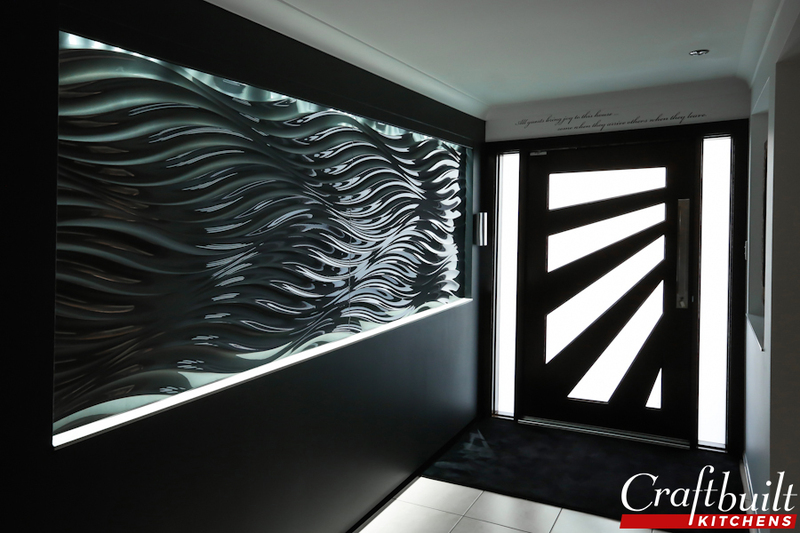 Contact our professional designers at Craftbuilt Kitchens today at (07) 3341 9166 today to set an appointment. https://www.craftbuilt.com.au/wp-content/uploads/2017/04/craftbuilt-logo-2.png 0 0 osweb https://www.craftbuilt.com.au/wp-content/uploads/2017/04/craftbuilt-logo-2.png osweb2016-06-06 06:53:412017-11-28 02:47:24We Want A New Bathroom For Christmas!